I got a little artistic with the poll last week and just posted some colors. I figured brown wouldn’t win and I was happy that it didn’t. Brown would’ve been too easy. Red was just right though. First thing’s first, I definitely didn’t want to use food coloring for my red food. That would be cheating. I also wanted to make something that you could conceivably make for the weekend as a treat. There aren’t a huge amount of options for natural foods that dye things really red. Tomatoes are an obvious choice, but not great this time of year. Raspberries will get you there, but you have to use a lot if you want a really red food. No. The answer if you want something red is beets. I will go on record as saying that beets are the reddest food out there. Look at the photos of this post and then prove me wrong. Once I settled on the beet for my dye, I just had to decide on what I wanted to put them in. Through a very scientific method (wondering around my kitchen looking at other ingredients I had on hand), I settled on beet brownies. I figured the beets might give the brownies a unique flavor and texture. Most importantly though, I knew they would be seriously red. 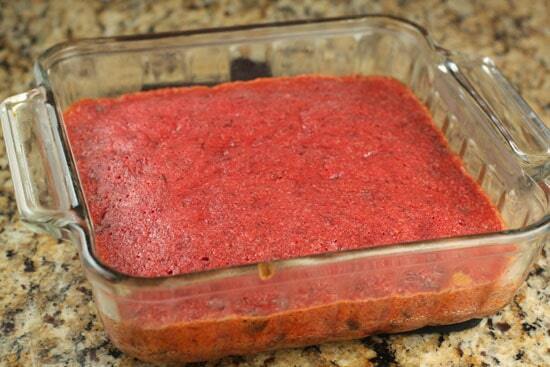 Sounds crazy I know, but beet brownies are actually really good and their bright red color will shock your guests! 1) Peel beets and shred them using a tiny grater. 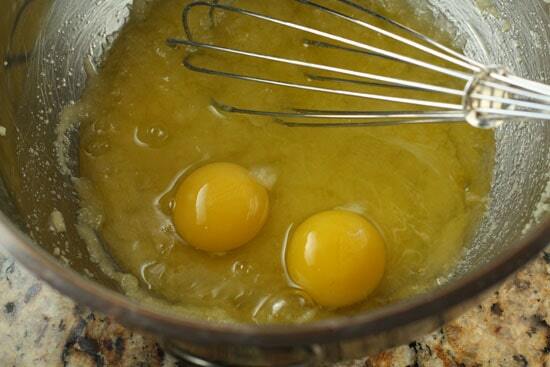 2) Melt butter and whisk together with sugar. Let cool for a few minutes. 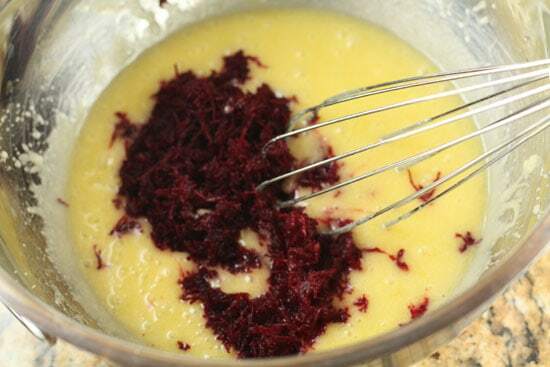 3) Add eggs, salt and beets and whisk. Then whisk in flour. 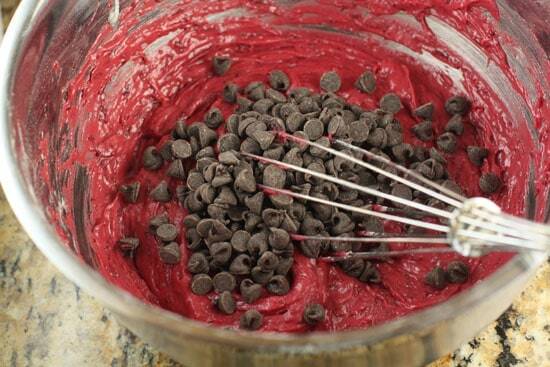 4) Fold in chocolate chips to finish the batter. 5) Butter a small 8×8 baking dish and pour in batter. 6) Bake at 350 degrees for 25-30 minutes until brownies are firm. 7) Cool for a few minutes before serving. 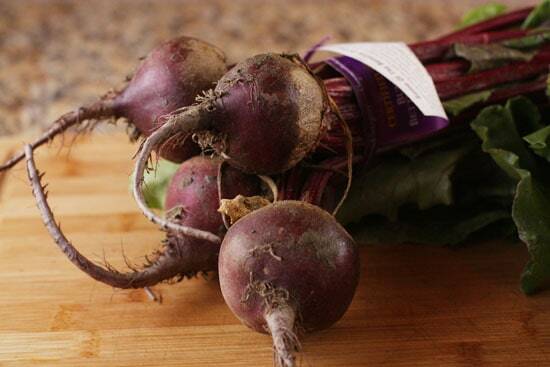 This recipe is really simple mainly because you don’t need to cook the beets before you use them. Rising on my list of fave veggies. If you get whole beets, just chop off the greens (you can saute them like you would spinach if you want). Peel the beets and then shred them using the small grates on a box grater or a microplane zester. 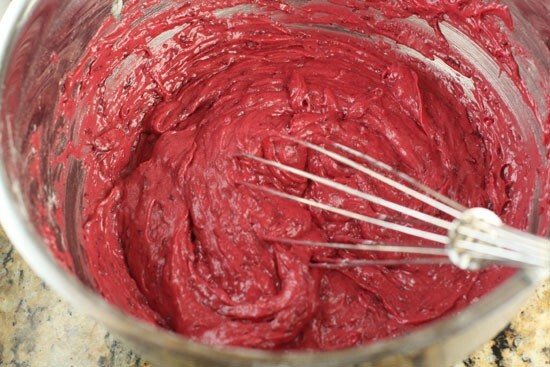 You’ll end up with a dark red mash of beets. Oh. And your hands will be red for about 24 hours also. Set the beets aside for later. 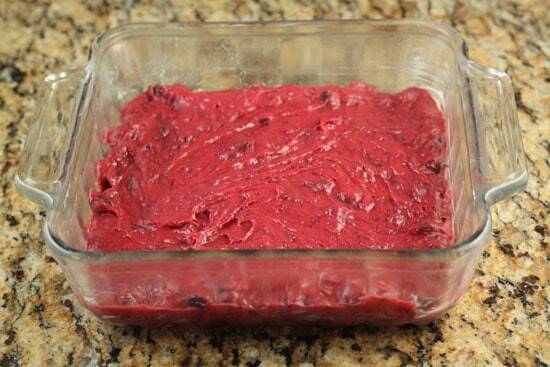 This is a really simple brownie batter. Most brownie batters start by melting butter and chocolate together. I didn’t want to do this though because the chocolate would hide my red color! So I just added some chocolate chips to the batter at the end. Anyway, still melt the butter though and then whisk together the sugar and butter. Once it’s cooled a bit, add the eggs and stir it together. Next, add the shredded beets and the salt. Whisk whisk whisk. Stir this together and then add all the flour. This is when the color really pops. 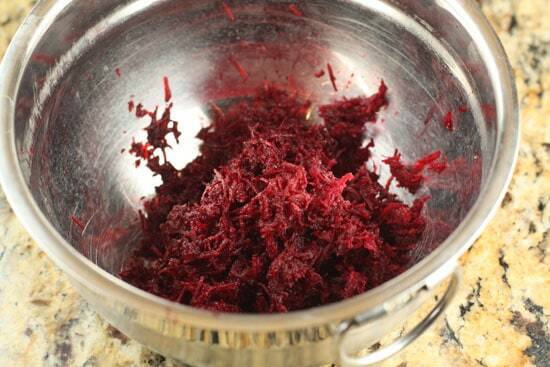 The shredded beets are so tiny that they almost melt away and you’re just left with this crazy red batter. It looks like food coloring was added, but it’s all beets. Stir in the chocolate chips and you’re ready to go! Butter an 8×8 dish and add all your brownie batter. Don’t forget to butter the dish! Bake this at 350 degrees for 25-30 minutes. The one thing I noticed about these brownies is that they are actually better when they are not gooey. When they’re gooey, you can taste more of the beets and it’s a bit off. But when they are cooked more (mine took 25 minutes), then the beets disappear and theirs just a hint of their flavor and sweetness left behind. It’s a really cool dish I think. This is probably just another lesson that almost anything can be made really good if you surround it with butter, sugar, and chocolate, but I have to say that I really liked these. The color is fun and the flavor is unique. If you’re up for a bit of an experiment, give these a shot. Anybody ever put beets in baked goods? I know it’s occasionally used for red velvet cake also. I would have loved a pic of the scary beet knife dripping red beet juice. One of my fave tricks to play on beet newbies! Ha! Yea… there was even more for this recipe. A knife, a peeler, and a box grater! Serious beet carnage. well this is creative. what a great way to get kids to eat veggies as long as you don't tell them what's in it. lol love the pics! Nick- your blog today reminded me of the Christmas my mother made beet jelly, and gave a jar to all our friends and relatives. It was the most beautiful shade of red. We had it for Christmas dinner, and she refused to tell anyone what it was made of, until dinner was over. When i was going to school (eons ago), a cafeteria favorite was "Beatnik Cake" (Deliberately misspelled, I believe.) It was chocolate, too, and delicious, although not as red as your brownies. I prefer beets to food coloring any day! I've actually had an amazing cake with beets in the cake and frosting in Nashville. Loved it! Just finished a beet soup for Christmas eve and some beets left over. This recipe looks interesting. 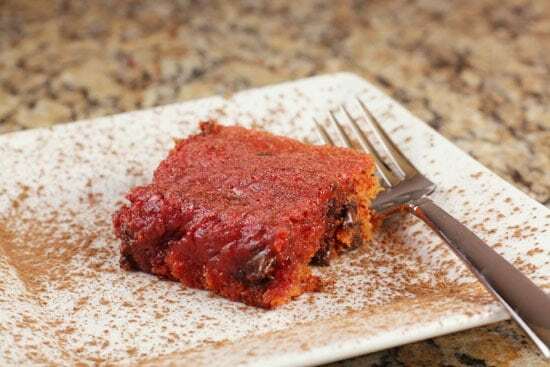 There is a marvelous recipe for "chocolate beet mini-cakes" in The 10 Things You Need to Eat by Lieberman and O'Connor that was my intro to baking with beets and they've been my go-to recipe when I want something sweet and healthy, too. Whole wheat flour, beets, yogurt (I use Greek), what's not to like. And if you don't spill the beets, no one will know they're good for you! « Pesto Quinoa Salad Recipes Home » Happy Holidays!